The GTA today celebrated the 202nd birth anniversary of Nepali poet Bhanubhakta Acharya, providing a platform to apolitical literary figures to voice their opposition to the manner in which the state government had remembered him on his birthday on July 13. At the July 13 event, President Pranab Mukherjee, Bengal governor Keshari Nath Tripathi and chief minister Mamata Banerjee delivered speeches. But GTA chief executive Bimal Gurung was not invited to address the gathering though he was on the dais. 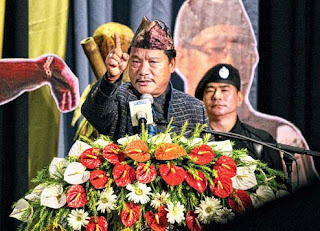 The next day, Gurung said he was "hurt" that he hadn't been invited to speak at the event. The GTA decided to hold the birthday celebration today as the state government had already fixed a programme on July 13 to remember the poet. Today's event was held at Gorkha Rangamanch Bhavan. Few had expected that literary luminaries would target the government on the manner in which Bhanubhakta's birthday had been celebrated. Jiwan Namdung, a well-known literary figure and former president of Nepali Sahitya Sammelan, said: "I watched the July 13 event on TV and I did feel hurt. This year, the Bhanubhakta birth anniversary was conducted in English. There is nothing wrong in conducting an event in English or for that matter, in any other language. Other medium of language should be used if the general public does not understand Nepali. It was our poet's birthday and the event was being held in Darjeeling and yet, Nepali language was lost in oblivion." A soft-spoken Namdung, who is known to be apolitical, went on: "There is a limit to humiliation. Don't you feel that the wounds got some relief today? I felt relieved. Hope we don't have to celebrate our poet's birth anniversary in English from next year." It was not just Namdung, another apolitical writer, Jay "Cactus" Gurung, too, spoke on similar lines. "Although I only use Jai "Cactus" in my writing, I am a Gurung by caste. Hope, a day does not come when only people from the Gurung community will start reading my works," Jay said in an oblique reference to the thought in the hills that the state government was "dividing" the hill community on caste lines. "I do not get emotional. But today, I am a bit emotional. There is a difference in the way the event was celebrated then and today," said Jay. People from various walks of life were present and more than 70 per cent of them were in traditional attire. The GTA's information and cultural affairs department had ensured that the programme highlighted the hill culture.